House Speaker John Boehner told members of the LGBT Equality Caucus last week at a historic first meeting that the Employment Non-Discrimination act had no chances of seeing a vote in 2014, the Washington Blade reports. 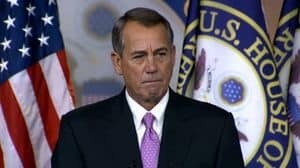 Calling the discussion between Boehner and the lawmakers “a historic sort of meeting,” Takano later clarified he was referring to the LGBT Equality Caucus, a 113-member group of lawmakers committed to advancing LGBT rights, and said the meeting took place “a few days ago” or last week. A “session” of Congress is equivalent to one of the two years in which a particular Congress meets before a new Congress is seated, so Takano’s account of the meeting indicates ENDA won’t see a House vote in 2014. Details on exactly who attended the meeting or its exact date were not disclosed. LGBT advocates had been pushing for a mention of the legislation from President Obama in his State of the Union address but that did not happen. Speaking to reporters aboard Air Force One en route to an event in Pittsburgh, White House press secretary Jay Carney said Obama's position on LGBT-rights is "crystal clear." "When it comes to the Employment Non-discrimination Act, he is fiercely supportive of that effort, enormously gratified by the fact the Senate took action and very hopeful that the House will follow suit. Because as I've said many times, reflecting his opinion, members of the House who block this are being left at the station as the train moves forward on what would obviously be an America where equal rights are extended to all Americans," Carney said. "So I think his record on LGBT rights is crystal-clear, his position is crystal-clear, and he continues to press Congress to take action on ENDA." The other option would be to issue an executive order, which the President appears to be reluctant to do.